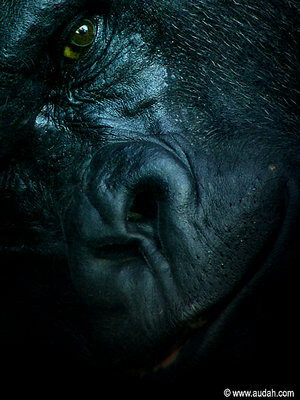 excellent portrait of King Kong!!!!!! You have got here a very, very powerful photo! There is a huge deal of reproach in the expression of this ape. I almost tend to say "portrait" even though the term "portrait" seems to be reserved for humans only. It very remarkable how you have cropped it by moving the eye close to the top left corner. That enhances the almost instinctive sense of being watched over by someone so forceful. I also like to cold bluish tonality, which further enhances the overall tension of the image. This is a very noteworthy photo that I believe will be a great success. stunning shot! this is going straight to my favs!